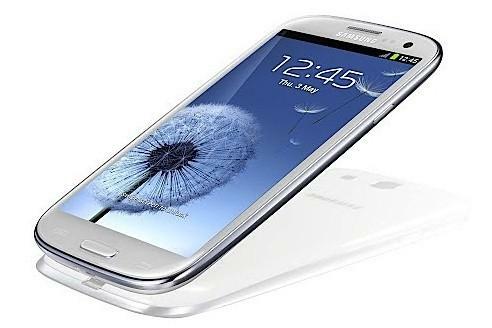 Here are four things you should know about the Samsung Galaxy S III. Samsung executives today claimed that their new Galaxy S III was "enhanced with nature and human emotion." While we can't exactly verify that claim, we can take a look at some of the specifications and features on Samsung's latest smartphone. It comes equipped with software that "knows you." One of the more innovative features of the new Galaxy phone is its ability to actually watch, listen and respond to you through its camera and voice software. For instance, the device's camera can see when you're looking at it and will respond by keeping the screen lit up so you don't have to periodically touch it to keep it from blacking out. Similarly, the new Galaxy's "S Voice" voice recognition software is a Siri-like feature that lets you give your phone commands without touching it. In other words, if your phone alarm goes off, you can just shout out "snooze" to get it to shut its yap rather than fumbling around trying to press the "off" button. Similarly, you can use S Voice to write emails, check the weather, take pictures, etc. It will not initially feature LTE connectivity. Quad-core processors are pretty fast, but they're also pretty large and Samsung apparently couldn't fit an LTE chipset in with its super-speedy CPU. So when the device hits the shelves in Europe this month and in the U.S. next month, it will have HSPA+ connectivity and standard Wi-Fi options, but no LTE. For U.S. consumers this means that the initial version of the device will likely be available on AT&T and T-Mobile, both of whom have nationwide HSPA+ networks, but not on Verizon and Sprint, which both rely on the CDMA-based EV-DO Rev. A for their 3G technology. Samsung has said it will release an LTE-capable version of the device sometime this summer so you might want to hold off on buying it if you absolutely must have the fastest mobile broadband technology available. Yes, it runs on the latest version of Android. Like all the new Android devices hitting the market, the Galaxy S III runs on Android 4.0 ("Ice Cream Sandwich") that has been designed to deliver the same user experience across different smartphones and tablets. Among other things, the newest version of Android features a home screen that can unlock using facial recognition software; Android Beam, technology that lets users send contact information, directions, Web pages and more via near-field communications by tapping their phones together; and integration with the Google+ social network that lets users host online video chats among their circles of friends.